The Days of Johann, an agility dog! : What we've been up to this week! Lots has been going on this week. Since Mum has been feeling better from her fall a couple of weekends ago, we've gotten a lot more done. 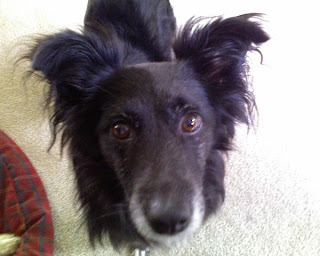 She's been working with a few new pet business marketing clients and really loves helping them out. And we've got another new one starting next week - an online dog store, cool! Mum got the lawn mowed yesterday. It was about time, Gracie was getting stuck in the grass doing her weaves! She's getting ready to fertilize (organic fish emulsion) for the last time, since here in the Midwest the Fall is the best time to fertilize. You can read about our organic lawn repair experiment over at Raise A Green Dog, here and here! Some of the leaves have started to turn. They aren't as pretty as previous years because everything has been so dry lately. But take a look at our Burning Bush. It's beautiful this year! Guess it likes it dry. We had agility practice this week, a private with our Trainer. Gracie was super hyped since the sheep where out in the next pen, so she and Mum got in some good training. She was very, very focused, really acted like she wanted to do her 'job,' and she nailed nearly all her contacts, and got 80% of her weaves. Mum learned a few tips. Trainer said that Gracie still needs some help from Mum in the weaves. She knows how to do them, knows how to get the entrance. But when she gets in super hyper mode (which means she's stressing a little), she needs Mum's support. It helps if Mum gives her lots of good girls through the weaves, and keeps her hand low to help her focus and keep her concentration. Gracie was so fast on some runs that Mum couldn't keep up with her at all. Mum used her opposite arm to keep her from turning in to her and continuing on a drive - three jumps to a table. Gracie read it so well, helping her from taking an off course aframe; her favorite. Gracie was at the table before Mum got to the last of the three jump s. And she did an immediate down. Good girl! Mum also learned that if she shortens her stride (like she does with me) on Gracie's dogwalk contact, she gets it well - pretty much wherever Mum is. I had really good speed in practice this week. Mum was handling me with only rear crosses and at good distances. My weaves are becoming more consistent in speed, so Mum thinks she needs to work again on me gaining speed in them. She thinks I have more to give. Mum and trainer talked about gambles some. Mum really needs to think more about how she is handling my movement in gambles. She needs to hold her position until I'm fully committed, and use my turn command when appropriate for an out jump or other obstacle. I can get them, if Mum handles me right, duh! I made all my contacts, dogwalk and frame. On jump sequences she just needs to work on her timing with her lines. With my varying speeds it's such a fine line. Trainer suggested we work on quick and faster releases coming off the table. We both have quick downs, but we're both slow on the release. Good stuff to work on to gain a second or two. Since the weather has been cool out, highs of about 60-65, we have been on the move almost all day, everyday this week. 'Bout to drive Mum buggy! She's getting us more exercise with some sequences and weaves in the back yard. But we still want more. Every time she moves, we run to the door to go outside. So she can't wait to see how both of us do this weekend at the USDAA trial, we've got some energy to burn. I'm entered in Grand Prix, Standard x2, Snooker, Gamblers, Jumpers and Relay. Gracie is entered in Standard x2, Gamblers and Jumpers. Hopefully we'll find someone willing to video tape us this weekend. We sure hate to be a bother to folks, when they are busy running too. But maybe we'll get lucky. And Mum will get that Cat5e patch cable taken care of and we'll be good to go. Use the cheese to get Gracie's focus before her runs - use the practice jump off leash and work her warm up. On Gracie's start lead outs, be quick about them and deliberate, so Gracie doesn' t have time to think of doing something on her own. Keep up the chatter and good girls with Gracie during her run to help her concentrate, focus and be confident. Move less with Gracie if she's running super hyper, and make her moves deliberate, so Gracie can read her better. Keep her hand motion going through Gracie's weaves for confidence; and keep it low for driving through. Anticipate my speed before the run if she can, and keep her lines accordingly in jump sequences. Send me to the next obstacle after the table, for a faster release. Keep me obstacle focused by queuing the obstacles earlier and by name, and use her acceleration to the next obstacle. Decelerate to keep me tight on jumps, and pre que to the next jump/obstacle if appropriate. Keep her shoulders square when sending me to an out jump, until I take off, then move. Use the cheese only when I'm not in hyper mode to get me there. Use the regular treats before runs when I'm in hyper mode. Show me the dog running before me if they are fast to get me more motivated for speed. Hold her position when sending to gamble obstacles until I am fully committed. Run as fast as she can through the last jump to keep my speed up through the end. Mum has been thinking a lot about Gracie this week. She watched DogTown last Friday night, and saw a pup that Best Friends had rescued from living on the streets. The dog liked humans, but really didn't see any point in playing with them - there were other dogs, and the wide open spaces that really interested this pup. Every time Mum feeds all four of us (early in the morning and late in the afternoon) it seems that Gracie and Wiggy have a ritual. Wiggy will saunter over to Gracie and start rubbing up to her, while Mum is getting our food ready. Gracie then begins reciprocating and starting to clean Wiggy's ears. Sheesh it's disgusting! Get a room, will ya! 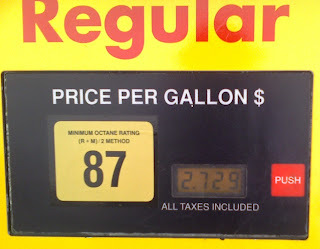 On our way to Trainer's house yesterday, we were amazed at how the gas prices have plummeted. Take a look at this! $2.72.9 for regular. I don' t think gas has been this low in price since before I was born! If you read our post yesterday, you know we participated in the Pet 'Net Adoption Event. It sure was fun. We joined with about 15 other pet bloggers in bringing awareness to the great benefits of pet adoption. The event was mentioned on the Today show, and we hear there's been some other press. And we got some blog traffic; well over 350 new visitors to Rescue Me, and about 50 new visitors to both my blog and Raise A Green Dog yesterday. We got to meet some new people and pups from all over the country, through emails and comments. And we got to read all the other blogger's posts - who all did a great job in promoting pet adoption. And last but not least - I got some mail today! My new title pins - SAM and RM - arrived in the mail. So Mum quickly reorganized my title pin display and added a new picture, since the old one had faded from the sun. 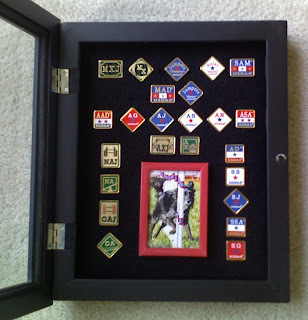 (You can click it to enlarge) I think there's just enough room for a couple of more USDAA title pins, and the MACH and ADCH, don't you? I need to get out in the yard and clean the flower beds too! Good luck with the competitions! I think my rat terrier would be good at agility, but I don't know that I'd have the patience. Maybe hubs can do it with her someday. Wow, you all have been really busy this week! Mom loves the bright red color of burning bushes too. All of your agility practice and training sounds great. I have had tons of energy the past few days too! Yay for cooler weather! Mom is lamenting the end of the summer but not me - bring on the snow! Well we hope you have some good luck at your trials! We're doing one this weekend too and having a ton of fun. I have a "blog award" for you. If you are interested, you can "pick up the award" (so you can post the award in your gadgets) on my blog. I just feel your blog is great, and being a huge animal lover myself, I wanted to share this award with you! Nice work on all your practicing for agility. That's great that your mom knows what she needs to work on to help you two get even better!